By Tapgang Apps and Games, Inc. Developer: Tapgang Apps and Games, Inc. The #1 Texture Pack Designer for Minecraft Texture designer for Minecraft is a professional Minecraft texture pack creation tool, Design the Minecraft textures you have always dreamed of right on your iPhone or iPad! 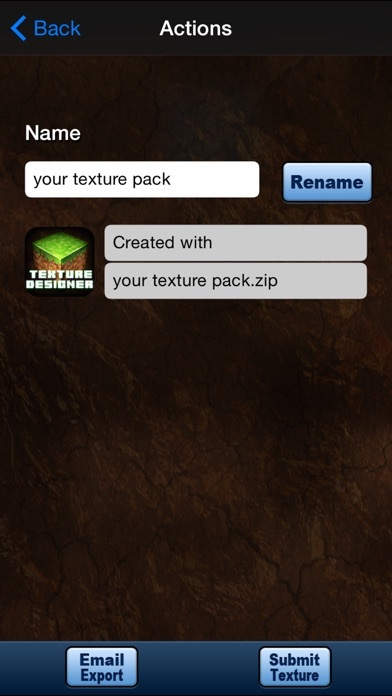 This beautiful interface makes designing, creating, modifing and exporting your texture packs using premium tools easy as ever! Modify hundreds of template textures or start your very own from scratch. Start creating your UNIQUE MINECRAFT WORLD TODAY! FEATURES - Tons of tools to color, draw, fill, zoom, copy / paste, and more to make all your dreams come true! 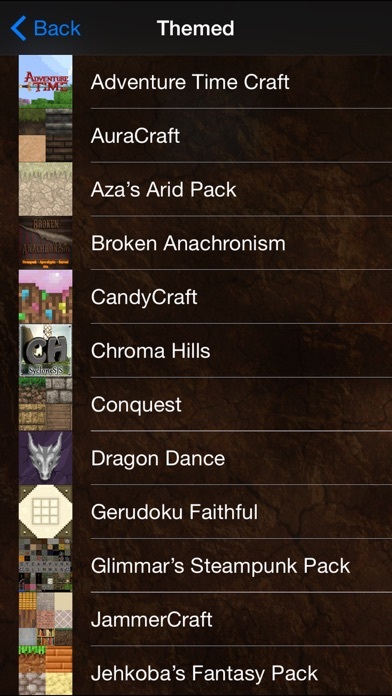 - 100's of pre designed Texture and Items Packs! 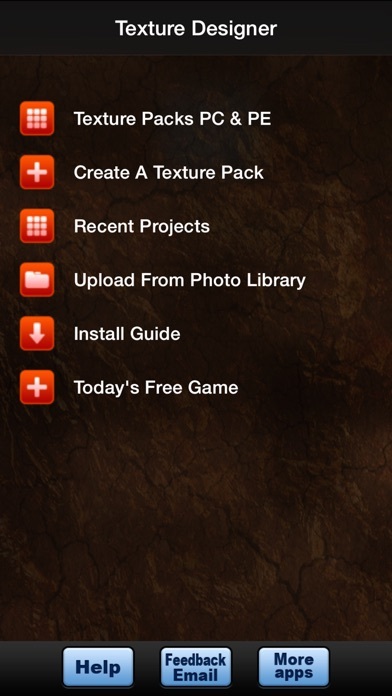 - Track and manage all your texture ideas within the app! - Save and import skins from your photo's library! - Unlimited amounts of textures at your disposal! - Developed for iPhone & iPad... 2 apps in one! - Send & submit your creations to the World! 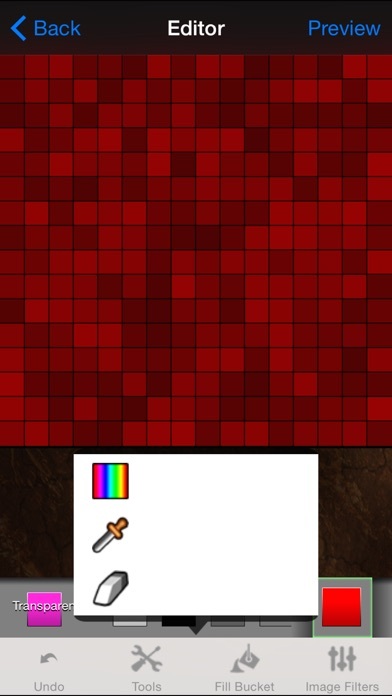 - No internet connection required to create your textures. - and much, much more! This is a must have resource for all Minecrafters. 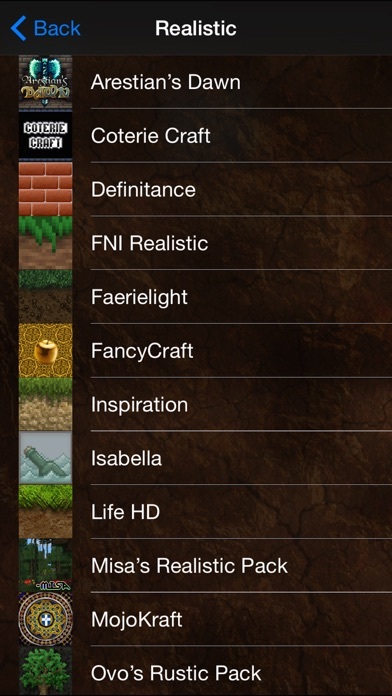 A brand new app to create and design amazing textures for your minecraft game. Download this professional quality Minecraft texture pack creator today! Disclaimer: -This is an unofficial tool / guide for Minecraft. We are not affiliated or related to Mojang. -This app adheres to the terms set out by Mojang -All items, names, places and other aspects of the game described within this application are trademarked and owned by their respective owners. We make no claim to and do not have any rights to any of the foregoing. This application is intended for educational purposes only. First of all I’m getting scammed with ads. Then I see that it says MCPE meaning for minecraft pocket edition so I clicked on that. I have some experience with apps kind of like this but there isn’t a share button to share to Minecraft. If you know how to fix this please let me know but until then my rating is a 2. Worst texture designer, do not use this!! Ads galore!! Could you please add templates for the shaped blocks? When I try to make the foot and the head of the bed, they don't seem to be the right shape or size. Limited things to edit, confusing, and I also thought it was for pe from the description. This app gives you limited texture options. You can only do one side of a block, you can not texture entities, such as a zombie, boat, etc. Wasted my dollar. More by Tapgang Apps and Games, Inc. Seeds & Furniture for Minecraft - MCPedia Pro Gamer Community! Tapgang Apps and Games, Inc.
iRoll Up the Rolling and Smoking Simulator! Guess the Heroes vs. Villains!